More than 1.6 billion people in the world remain without electricity. We know that clean water, improved healthcare, better education, safer streets and economic growth all start with power. 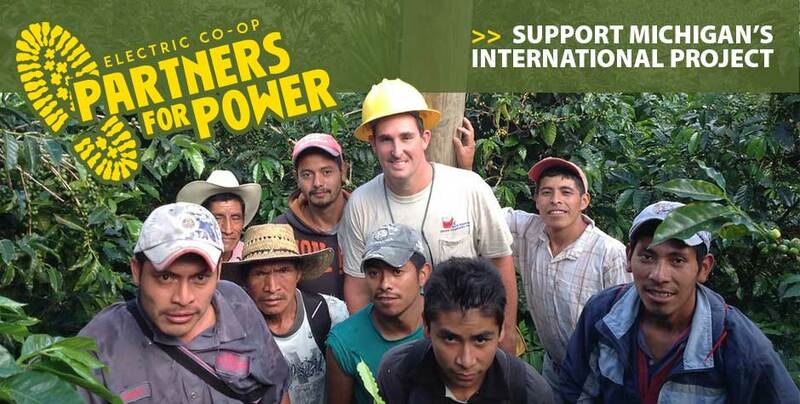 That’s why Michigan’s electric cooperatives are partnering with the NRECA International Foundation to bring safe, reliable and affordable electricity to remote villages in Guatemala. Four co-op employees are currently in Guatemala reviewing the project site and assessing what materials will be needed. The construction phase will involve a total of 10 lineworkers from Cherryland, HomeWorks, Great Lakes, Wolverine and MECA, and take about 17 days on-site this fall to complete. Michigan lineworkers will labor alongside Guatemalan locals who will be responsible for maintaining the lines after the team departs. The International Foundation began in 1962 as an agreement between NRECA and the U.S. Agency for International Development. Today, it has field offices in Bangladesh, Bolivia, Dominican Republic, Guatemala, Haiti, Philippines, South Sudan and Uganda. The Michigan project in Guatemala is supported solely through voluntary donations of time, skills, money and materials. Donations are tax deductible and can be made online. Praying for the safety of these linemen as they work to make life better for this part of the world!